SF Taxi Media: A San Francisco Resident's View On Rear Seat Passenger Information Monitors. MTA, You Should Read This. A San Francisco Resident's View On Rear Seat Passenger Information Monitors. MTA, You Should Read This. ... if anyone's saying that passengers love them too and are dying to have them in cabs here in San Francisco like in New York, then consider this little something that could balance some light on it. This is an excerpt from an article titled, "Pick Up Artists", by Bess Kalb. It was published in the Huffington Post dated July 19, 2011. To briefly introduce it, Kalb in her article talks about the many odd and colorful characters she's come across while taking taxis in San Francisco. Then there's a part where she briefly mentions the recent protests over credit card fees, rear seat payment terminals, and electronic waybills. Kalb is a San Francisco resident, a writer, and according to her article a frequent taxi rider. "Adding insult to it all, the newest card-readers are also TV screens. Without New York's barrier wall to mount them, San Francisco installed the monitors on a bendable arm that branches out from the passenger seat headrest, askew and obtrusive like a clip-on fan. For the past few weeks, the screens have played a single clip of an uncomfortable-looking Kate Hudson talking to Jimmy Kimmel about her pregnancy. It is irrelevant to life in San Francisco or anything remotely anywhere, but it succeeds in establishing the instant camaraderie forged by shared loathing in an intimate space. "Is there a way to turn this off?" "Sometimes you can, sometimes not." ("Pick Up Artists", by Bess Kalb. Published in the Huffington Post, July 19, 2011) CLICK HERE to read the full article. I don't think I need to interpret this excerpt for anyone with intelligence. But in case there's some closed minded people out there, or anyone with an ulterior motive, the author is saying that even if Taxi TVs are annoying, and serve little, if any, real valuable or redeeming cause other than ad revenue, they at least forge camaraderie in that everyone in the cab feels they are annoying. And camaraderie is a good thing. I say that's true... especially for the driver. You see, taxi drivers have held four protests recently. That was to say loudly, and without any doubt, that one of the key issues that drivers oppose are the "rear seat passenger information monitors (PIMs)", also sometimes referred to as 'Taxi TVs'. So, it's personally hard for me to believe that taxi drivers love rear seat payment terminals, even if there may be cab company presidents out there insisting that they do. Now that San Francisco's passengers are slowly gaining more exposure to PIMs, they may start including PIMs as part of the dialogue around taxis. This one, so far has been negative. But it's only one person. I wonder if people will eventually begin to rave about them... or not. Unfortunately, we may find out for sure because the MTA has heard the concerns from drivers but has not amended this policy. Cab companies are installing them. To make a long story short, the Municipal Transportation Agency (MTA) wants cab companies to put these in all of their cabs. In exchange, the MTA will allow cab companies to legally pass credit card fees onto their drivers at a rate of up to 5%. Charging drivers for credit card fees used to be a violation of the SF Transportation Code. But now with these PIMs, it'll be okay now. Keep in mind that most other businesses tend to pay a rate of about 2.5% - 3% in credit card fees, and some businesses can get even less. We taxi drivers pay 5% so passengers like Bess Kalb can now have a Taxi TV while riding in a cab. That's MTA policy. And the MTA says she wants a Taxi TV. The PIMs will play looping advertisements. 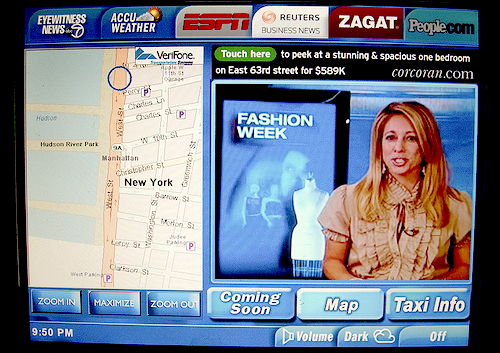 So cab companies may be profiting by splitting ad revenues with Verifone, Creative Mobile Technologies, or whoever the service provider of the PIMs may be. But us drivers and the riding public will never know for sure if companies are getting to profit by splitting advertising revenue with Verifone or others, because the MTA won't tell us... even if you ask. What's more certain though is that the PIMs are still annoying and cab drivers are upset. Four protests so far, and the threat of a fifth one on August 2nd is proof. The MTA has publicly shown some response to the drivers' concerns, but only verbally so far. At its June 21st meeting, Tom Nolan, the Board's chairman, asked if the agency could re-examine the fees to see if 5% could be reduced to 3%. He said this because he wanted to demonstrate to those concerned that the MTA was listening to those who were concerned and that the agency was expressing a desire to respond. In my opinion, the Board's chairman spoke in a well meaning gesture and the directors deserve some gratitude for showing a little compassion. - authorizing the removal of PIMs from the SFMTA credit card fee waiver requirement could make the 3% goal very possible. But there still has been no movement on the item so the deal is not done.